What to do when your hubby brings home some Kingfish from the shops cause it “looked interesting”? This was the dilemma I found myself in last week. Interesting it may look but no one seems to have a damn clue what it is. We consulted Rick Stein who only had one rather complicated dish but between Rick and the web we figured curry was the way forward. The Kingfish kind of looked like a meaty steak, like swordfish or tuna. As well as trying to make healthier stuff we’re also trying to save lots of money so we picked a fish curry that wasn’t going to break the bank with lots of fancy ingredients. Nigel Slater came to the rescue. 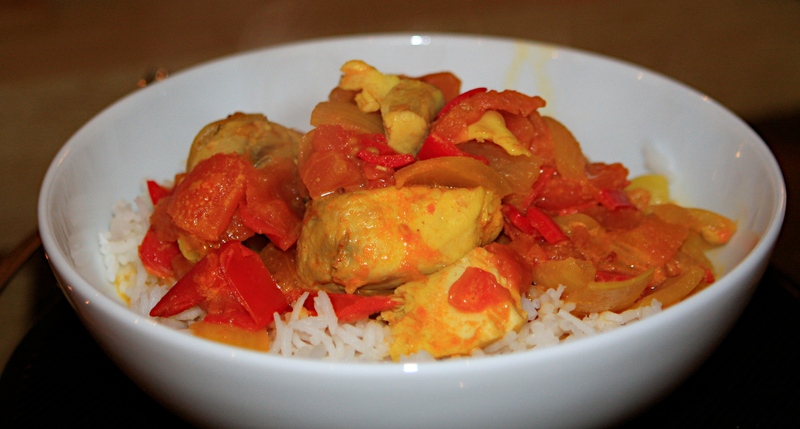 This is “a very fresh-tasting and really quite spicy fish curry” from his book Appetite and it was very good indeed. Peel and roughly chop onions and cook slowly with a small amount of oil in a casserole over a low heat, until soft and pale gold. Remove all skin and bones from fish and cut into large chunks. Sprinkle a tsp of mustard seeds into the onions, then seed and chop the chillies and add them too. Cook, stirring in the ground spices, till it all smells fragrant. Chop up the tomatoes and stir them in, cook down for five minutes or so, then pour in the stock. Bring to the boil and slide in the fish. Simmer until tender (6 or 7 minutes). Stir in the coconut milk, season with salt and simmer for a minute or two longer before eating. We ate it with basmati rice.